Hello. My name is Ron. I am a BIG fan of Gino Vannelli. Since SO MANY of you nice folks visit my home page as a result of a search for Gino Vannelli, I decided to create a page just for him. 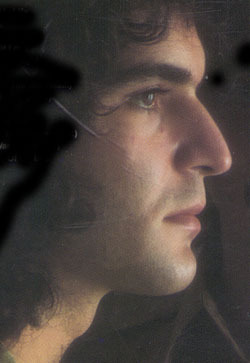 In fact, my page was the very first Gino Vannelli page on the Internet. Click here to visit my main home page. I first became a Gino Vannelli fan about 1975 when I was listening to radio late one night and taped a song on one of those old fashion reel-to-reel Magnavox tape recorders. This song was unlike anything I had ever heard come out of rock and roll. The song was "Where Am I Going." It was at that point in my life that I began to listen to jazz. Even though this song may not be considered jazz, it set the stage for my taste in jazz. At that point, I bought the Storm at Sunup album and just flipped. This stuff was excellent! And I had never really heard anything like it before. I immediately then bought Powerful People and of course the very best album, the first album, Crazy Life. Gino came to Dallas/Ft. Worth about 1977 or so and we all piled in the car and had the time of our lives at the concert. The thing that we enjoyed was that he sounded "just like the album". I saw Gino again when he appeared at the Arcadia Theatre on Greenville Avenue here in Dallas about five or six years ago. He rocked the Casbah. I couldn't hear anything for a week after that. It was great. I heard that I recently missed him at The Caravan of Dreams. I am heart broken that I did not hear about it. Crazy Life: 1973 The best album! Yonder Tree: 1995 Fantastic CD!